EU foreign policy chief Federica Mogherini visits Washington, says Iran deal can never be renegotiated. 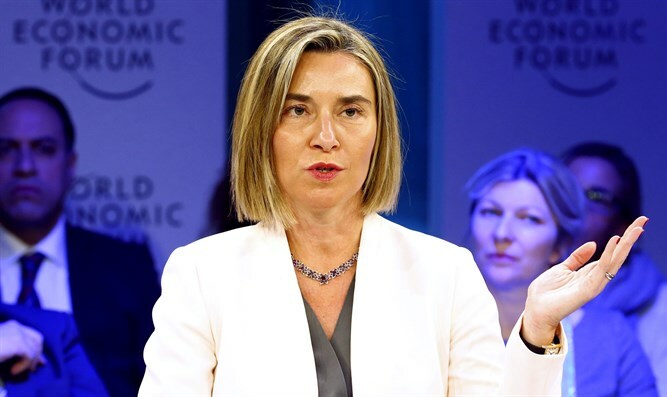 European Union (EU) foreign policy chief Federica Mogherini on Tuesday urged U.S. lawmakers not to scrap the Iran nuclear deal, warning it can never be renegotiated, AFP reports. President Donald Trump recently told Congress that he can no longer certify that the 2015 accord in the U.S. national interest, leaving its fate in the hands of the senators. Mogherini's comments came during a visit to Washington where she sat down with legislators on Capitol Hill. While she insisted Brussels does not want to interfere in Washington politics, she sent a clear message that Europe opposes any new U.S. law that would breach the terms of the deal. European countries have expressed their support for the Iran deal even as Trump has criticized it. Trump recently indicated he did not require cooperation from Europe on the deal, saying he does not object to France and Germany continuing trade with Iran. Senator Bob Corker, the head of the Senate foreign relations committee, and his Republican colleague and rising star Senator Tom Cotton are working on a bill which supporters say would strengthen enforcement of the Iran deal rather than to destroy it, noted AFP. Corker has also urged Trump’s administration to work closely with European allies as it develops its new Iran policy. Speaking to reporters after her talks with U.S. lawmakers, Mogherini said she had sought and received reassurances that the bill would keep the United States "compliant with the deal." "We are exchanging views with legislators on the need to make sure, before a bill is presented, that its contents does not represent a violation," she said, according to AFP. In a fact sheet to explain the proposed law, the senators propose that U.S. nuclear-related sanctions on Iran would snap back if Tehran violates "enhanced and existing restrictions." These "enhancements" to restrictions would end so called "sunset" clauses that would see some restrictions on Tehran's program phased out between eight and 15 years from now. Supporters of the deal argue changing these provisions of the Joint Comprehensive Plan of Action (JCPOA) signed by Iran and six world powers would itself collapse the deal. Mogherini pushed back strongly on the idea that the 2015 deal, under which Iran submitted to nuclear controls in return for sanctions relief, would "sunset" at all. "Article Three of the agreement says that Iran will never develop a nuclear weapon, for instance," added Mogherini, who also said that under the "foreseen ratification" by Iran of the International Atomic Energy Agency's "additional protocol ... certain commitments will become permanent." "Renegotiating is not an option," she stressed, insisting Britain, France, Germany, China and Russia will not review 12 years of complex international diplomacy because of U.S. concerns.